The activation e-mail arrived! YAY! And so we were started, pretty quick. Found the JS snippet and attached it to a site or two, just for testing. The sign up process is flawless, it’s simple and easy. Later, the same night, I found a few bugs in the product. Nothing big and nothing that would harm your kids. Just enough to be annoying, and my first thought was “this is useless.” – that did change quite fast though! I contacted the chat support again and reported my bugs, they took action immediately and within hours new code were pushed that fixed the issues. What they were isn’t important, since they have been fixed and dealt with. I have had some ideas for improvement of the system. And here’s the beautiful thing: all my requests, except for one, are either planned or already implemented, the last one is under review. There are two things to integration. One is the integration on web sites, the other thing is the IM integration used for chat agents. The IM integration is easy as well. 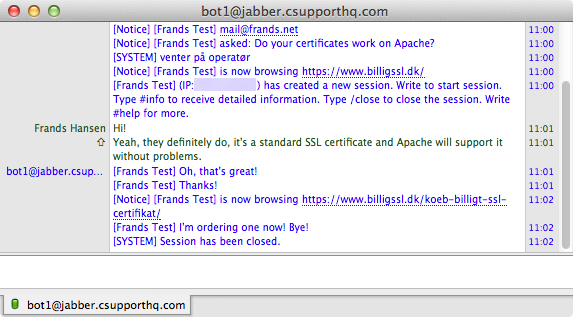 Add a Jabber account to your favorite XMPP client, accept friend requests from the chat bots. And done. Ready to go! cSupport is a startup. But it’s the kind of startup I like. We decided after a few days to pay for it and signed up for the paid Premium version. We have integrated it on 3 sites currently, and yes it does work multi-site. I would definitely recommend cSupport to others. When you hit a bump in the road, you can get help. If you have a good idea (that makes sense) it will be considered, and in my case have several ideas implemented. I, my company HelpSoft is not in any way affiliated with cSupport. This blog post is not sponsored or an ad. It is merely my excitement I am sharing with the world. This entry was posted in HelpSoft, Iværksætter, Nerdy. Bookmark the permalink. Both comments and trackbacks are currently closed.